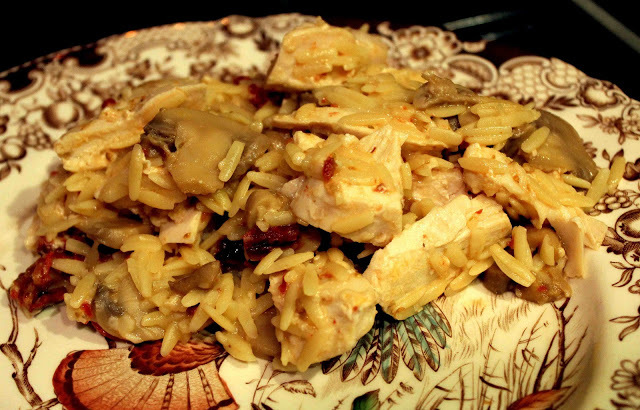 If you’re looking for something healthy AND tasty, look no further than this chicken and sun-dried tomato orzo dish. Matt and I both loved it and the dish is actually pretty simply to make! The sun-dried tomatoes combined with Parmesan cheese pack a flavorful punch along with the Italian aroma of the fresh marjoram and mushrooms. Serve with a side a green vegetables or salad and you’ve got a complete meal. Enjoy! Cook orzo in a large saucepan of boiling water until just tender, 8-10 minutes or according to package directions. Drain and rinse. Meanwhile, place 1 cup water, ¼ cup sun-dried tomatoes, plum tomato, garlic, 2 teaspoons marjoram, vinegar and 2 teaspoons oil in a blender. Blend until just a few chunks remain. Season chicken with salt and pepper on both sides. Heat remaining 1 tablespoon oil in a large skillet over medium-high heat. Add the chicken and cook, adjusting heat as necessary to prevent burning, until golden outside and no longer pink in the middle, 3-5 minutes per side. Transfer to a plate; tent with foil to keep warm. Pour the tomato sauce into the pan and bring to a boil. Measure out ½ cup sauce to a small bowl. 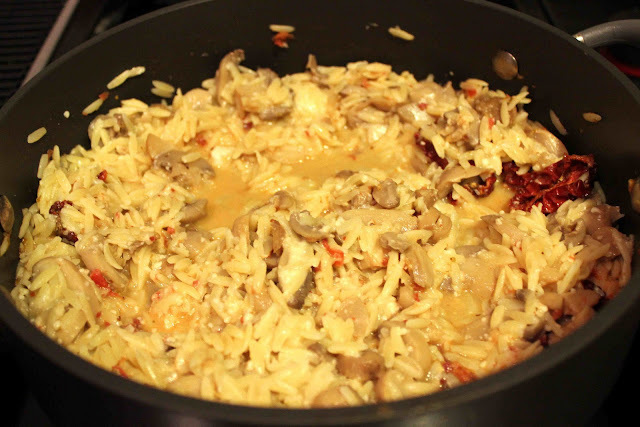 Add the remaining ¼ cup sun-dried tomatoes to the pan along with the orzo, mushrooms and 6 tablespoons of cheese. Cook, stirring, until heated through, 1-2 minutes. Divide among 4 plates. 2 Responses to "Chicken & Sun-Dried Tomato Orzo"
Hi! I was just looking at your website for the very first time and saw the pictures of the Chicken Sun Dried Tomatoes & Orzo. The sad thing is that is all there is: Pictures. I cannot find the recipe anywhere! I have clicked on the photos, scrolled through the entire page and there is no recipe for this dish. I love the photos…but I would like to know how you make it. I suppose I could come up with my own recipe, but thought I’d like to try yours. Thanks! Your site looks very appealing (especially when one is VERY hungry). Yum! Thank you so much for the kind comments. I’m not sure why the recipe didn’t post, but now it is up. Enjoy! !